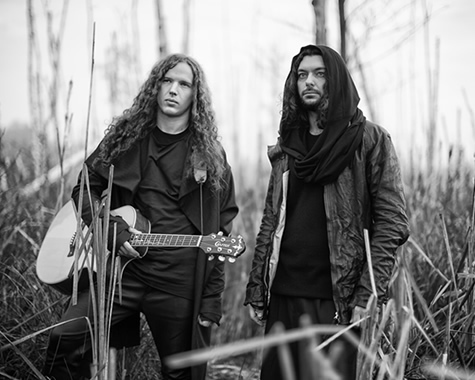 LION SHEPHERD is a new music project by Kamil Haidar and Mateusz Owczarek in which the musicians their inspiration in ethnic music. The music they create is a mix of world music, trance, progressive rock, blues, and Middle Eastern motifs. Among other performers, the album features Jahiar Irani (an Iranian musician who has made recordings e.g. for Kayah’s Transoriental Orchestra album) and Rasm Al Mashan (Naxos Orchestra, Soomood). In addition to traditional European instruments, there will be the Syrian oud lute, the Persian santur, and various Indian and Arabic percussion instruments. The project led by Haidar and Owczarek involves not only musicians but also graphic artists, filmmakers, design artists, people working with mapping art, and even fashion designers. The artists involved in the project will create unique performances that go far beyond the traditional notion of a concert. A vocalist and producer who has been active on the Polish rock scene for years. Released three studio albums, including two with the Maqama band. With this band, Kamil Haidar toured most of Europe. He has made recordings in Poland, Los Angeles, and the UK. Among the musicians he has worked with, one can name such stars as Doug Pinnick, who played with the legendary King’s X band, Michael Parnin, Chris Sheldon, known for his work with U2, Biffy Clyro, and Skunk Anansie. References to Middle Eastern music are his trademark. They are present in all of his productions, no matter if it is rock, acoustic music, or world music proper. He is a recognized multi-instrumental virtuoso and is considered to be one of the best young guitarists. Prizewinner of numerous music contests and a demon for studio work. Despite his young age, he is a very experienced concert performer who has toured throughout Europe. He has played on stage with many Polish and international stars, including Zbigniew Hołdys and Michael Lee Firkins. He is a co-founder of the Lion Shepherd band, where he plays not only an electric guitar, but also an Arabic lute and all kinds of acoustic guitars. Mateusz Owczarek is a co-author and co-producer of the Hiraeth album.